Syncata provides business consulting and systems integration services that help companies plan and implement innovative solutions for the extended enterprise. Syncata assists clients in assessing strategic options and guides them through the detailed process of change management and information technology (IT) implementation to deliver practical solutions. Syncata has over a decade of experience working across various industries including automotive, high-tech manufacturing, financial services and insurance. Syncata is a niche player in an established consulting market, competing against Big 5 consulting firms such as Accenture, KPMG, Cap Gemini, Ernst & Young and Deloitte & Touche. These firms have respected names, tremendous brand recognition and enormous advertising, marketing and promotional resources. Syncata is an established, but niche innovator with clients like Intel, J.P. Morgan, Honda and Pacific Life. In business for more than 10 years, Syncata had raised capital ($35 million in 1999) but still needed to raise awareness. Faced with an onslaught of additional newly funded competitors, Syncata was under pressure to find a way to differentiate their IT services. After extensive strategic planning, Syncata chose to adopt a vertical industry approach to their marketing communications effort. To reinforce the new approach, Syncata tapped Schwartzman PR to develop and execute a comprehensive public relations program. The firm focused on raising awareness of Syncata by publicizing the firm’s recent achievements with clients in the financial services, semiconductor, high-tech manufacturing and automotive industries. To achieve this, Syncata would need intelligent, well-written press materials, publicity photos, an electronic press kit and an online pressroom. Schwartzman PR conducted interviews with Syncata’s senior managers and practice area leads. Using transcripts, the agency drafted and managed approvals to complete Syncata’s press materials including a company backgrounder, company profile, company fact sheet, executive biographies, FAQ, and case study documents in just 6 weeks. Most importantly, the new press kit clearly articulated and quantified in jargon-free English the measurable business value that Syncata had delivered to its past clients. In addition to the new press kit, Schwartzman PR would need to find a way to make journalists covering Syncata’s target vertical industries take notice. Position Syncata Corporation as an information technology consulting leader in the financial services, semiconductor, high-tech manufacturing, and automotive industries. As a professional services firm , Syncata’s IT implementations are performed for its clients. Therefore, publicizing these initiatives would require the cooperation of the firm’s clients. Schwartzman PR would need to find a compatible way to promote these deployments without ruffling feathers. This required developing and approving communications that support the marketing agendas of all involved parties. Created and maintain segmented news media contact databases by vertical industries. This involved creating accurate lists with influential journalists and industry analysts covering the financial services, semiconductors, high-tech manufacturing, automotive and IT services sectors. Create and distribute communications that demonstrate Syncata’s knowledge and expertise in these areas. Distribute timely press materials, which support Syncata’s messaging, to generate media placements and public speaking opportunities. Maximize public relations opportunities at trade shows and conferences. Book and coordinate all logistics for Syncata’s industry analyst briefings and queries. Influence the influencers to emerge in research reports and on magic quadrants to generate major accounts leads. Schwartzman & Associates delivered high-value strategic communications services that produced measurable results for Syncata Corp. Schwartzman & Associates was able to craft targeted communications directed at key analysts, trade and technology media, raising awareness and building credibility. Syncata found that it was able to accomplish its strategic objectives, drive new business and realize real results from its marketing communications expenditures. To promote the opening of Syncata’s new Oakland office, S&A created the ‘High-Tech Economic Development Award’ and arranged for Syncata’s executives to present the award to Oakland City Mayor Jerry Brown, attracting the attention of the entire Bay Area news media including KNTV (WB), KGO-TV (ABC), KRON-TV (NBC) and National Public Radio among others. Obtained clearance from Microsoft Corp., Arrow Electronics and Linear Technologies Corp. to shoot live interviews with executives involved in Syncata’s beta of BizTalk Server 2000, generating extensive coverage in high-tech manufacturing trade publications and dozens of qualified sales leads. Working through the publicity departments of Honda and Toyota, handled all media relations disclosing Syncata’s IT implementations for these automakers without revealing any details which might compromise the competitiveness of these deployments. Developed and executed a highly customized media training program for Syncata’s 200 employees at four different offices to help the firm communicate more effectively with the analysts and the media. Instituted a corporate disclosure policy to help Syncata’s sales personnel distinguish between proprietary and non-proprietary client information when discussing Syncata’s services publicly. Drafted and approved case studies on Syncata’s initiative in each target vertical industry, securing client testimonials and quotes from Syncata’s practice area leads. Secured media placements in CIO Magazine, IT Contractor Magazine, Detroit Free Press, Automotive News, iSource Magazine, E-Commerce World Magazine, InternetWeek, Electronic Buyer News, Electronic Engineering Times, Electronics News, eWeek, Ward’s Auto Business, InfoWorld, Business Week, Wall Street & Technology, Information Week, Los Angeles Times and many more. Press clippings available on request. "After interviewing a number of leading technology public relations agencies, we selected Schwartzman & Associates because they took the time to understand our business challenges and proposed a program which reinforced our existing marketing communications efforts. Since then, the visibility Syncata has gained through dozens of print and electronic media placements in specific vertical industry publications has helped us build awareness, make short lists and accelerate our sales cycle," said Ujj Nath, president and chief executive officer, Syncata Corporation. 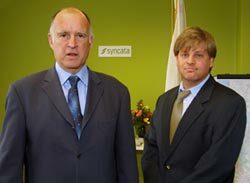 Click to here to play television news clips featuring Oakland City Mayor Jerry Brown receive Syncata's High-Tech Economic Development Award.